It seems like a lot (it a lot) but there is so much more to go! From 5 inches of ribbing yesterday AM I went to 8 inches of ribbing. The sleeves (the pair of them) are taking shape. The deep snug cuff is rapidly becoming wide--(and will become wider and fuller with each round) making a batwing shape that will define this as a shrug and not a sweater. From the starting point (cast on) to the shoulder (sans ease, and I think I will need an inch or two of ease) measures (on me) 23 inches. So not quite half way—in length. Still for 2 days effort—not a bad result. The colors are lovely and stagging and not a simplistic stripe—and even though they are same dye lot—there is a lot variety in the 2 skeins. Last night Diane—a newish knitter (ambitious, but still new!) looked at the colors and said “amazing” and I laughed-- the yarn is AMAZING—that is Lion Brand's Amazing. And it is pretty amazing. I am very happy with it, and how its knitting up. 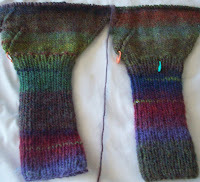 It was a toss up between this shrug in this yarn or a vest (a EZ rib warmer type vest) in Noro—and this yarn won out. It's lovely to knit with—and this design is more forgiving. I will want the vest to be more or less matching (on the center fronts) and that will require more effort. 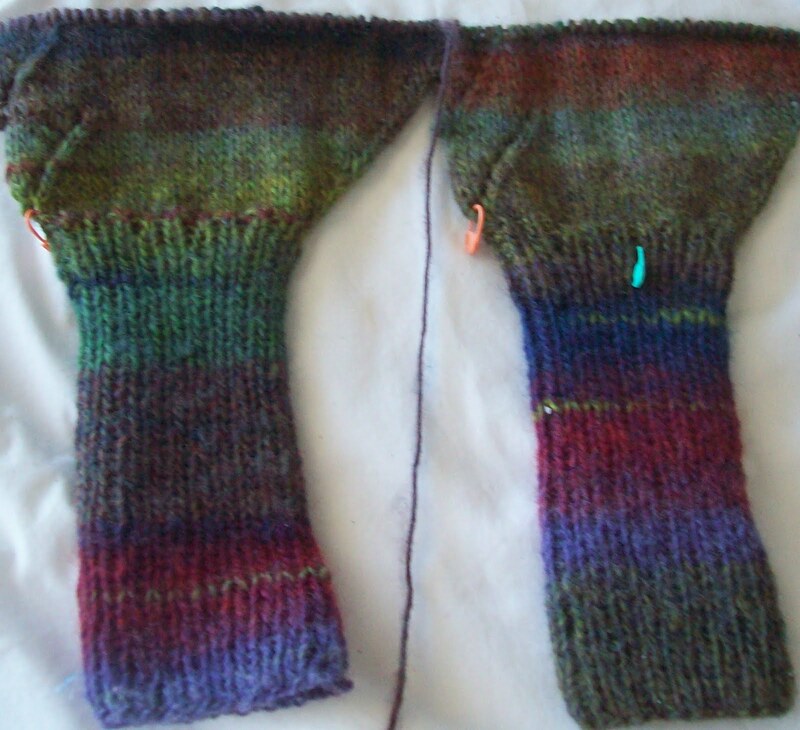 (The Noro is ReCycled—and the previous knitter has problems (it was a WIP). I have a few full skeins, and may partial skeins--all use in her effort to get a neat match of colors/stripes. A vest will be simpler to match up--but it will still be an effort. I will be knitting the vest front first, (getting as good a match in color ways as possible, and let mis matched color stripe occur on the back. ) --that is --when I get around to spending time sorting what I have, and making up two sort of matching skeins to start. I know the Noro will soften up when its washed—but for now its messy to look at (so many partial skeins) and rough in hand. But I do like the jewel tone color way! Don't expect to see as much progress between today and tomorrow as there has been between yesterday and today—but I do expect to have this finished before the end of the month.